Rhubarb isn’t exactly sure whether it’s a fruit or vegetable. Although widely considered the latter, a New York court decided in 1947 that since it was used in the Unites States as a fruit, rhubarb should be counted as such. (This reduced rhubarb tariffs, which were higher for vegetables than fruits.) It closely resembles celery, but with a pinkish green or even deep magenta hue that clearly sets it apart. Use raw stalks in fresh, crisp dishes for a strong, almost sour taste. Rhubarb’s tart flavor also makes it a perfect ingredient in desserts, complimenting the sweetness of crisps and pies. For this, it boasts the title of world’s favorite “pie plant”. When to Buy: Bright red, slender “hothouse” rhubarb is available almost year-round, but the traditional greener variety can be found at markets in mid-spring. Its season varies depending on your region, but you can usually find it beginning in April or May until September. Buying from farm stands or farmers markets is your best bet, as rhubarb in supermarkets is sometimes shipped in from far-away locations. What to Buy: Buy stalks that are crisp, with shiny skin. Steer clear of rubbery and dry stalks. Prep & Storage: Wash the stalk to remove any dirt, then trim off ends. If they haven’t been removed already, make sure to discard the leaves, as they contain oxalic acid and other toxins. Store in a loose Ziploc in the crisper drawer. When chopping the stalks, keep the skins on to maintain as much color and flavor as possible. How to Cook: Rhubarb stalks are often cut into 1-inch pieces and stewed in boiling water or baked with sugar. Through this process, its taut fibers break down and its juices thicken into a gelatinous sauce. The result is a delicious jelly-like consistency perfect for jams, chutneys, and compotes, but this reddish mush isn’t the prettiest thing you’ve ever seen. Instead of displaying it for all to see, I like to hide its appearance in pies, crumbles, and crisps. 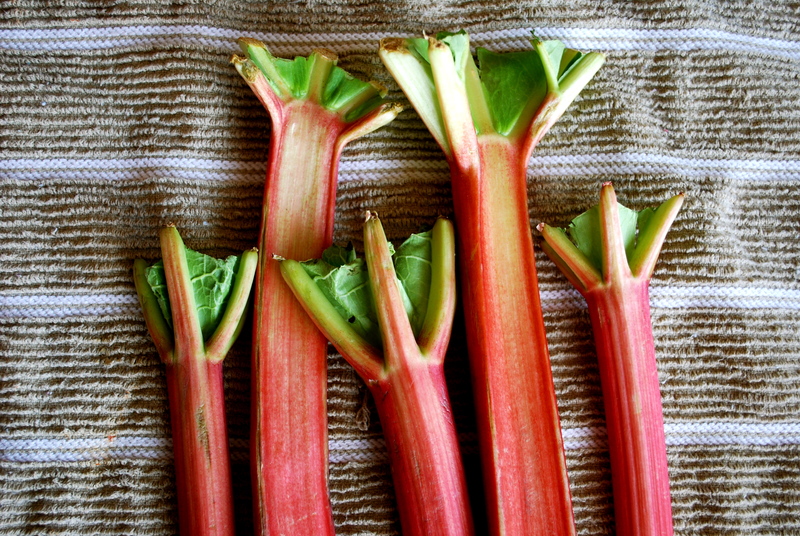 Recipe Box: Check out our favorite rhubarb recipes! 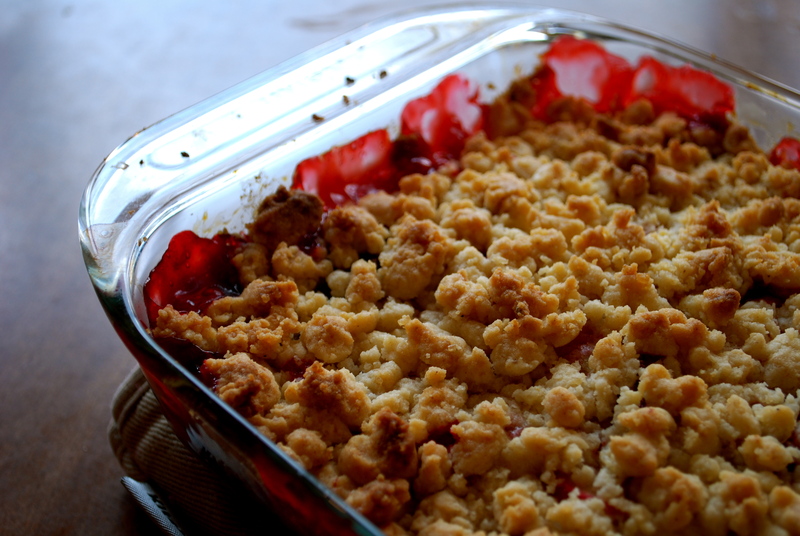 The strawberries set off the tartness of the rhubarb to make a wonderfully gooey dessert. This rhubarb curd has a gorgeous color, making for elegant and tasty shortbread bars. This simple salad incorporates textured ingredients and complementary flavors. A great way to use raw rhubarb! This tart sauce drizzled over pork chops or chicken lends a nice sweet and savory contrast to brighten up dinner. A refreshing summery drink that will blow regular lemonade out of the water. Hannah Doolin is a magazine journalism major at Syracuse University. She’s ecstatic that barbeque season is upon us so she can make summery treats like rhubarb crumble for months to come.